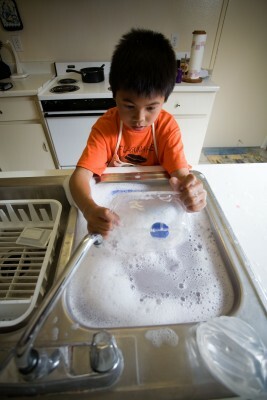 Those who are familiar with this blog probably know I'm a big believer in having kids do chores. * Yet even so, I often forget to reconsider what chores I should give to the kids. Children grow and mature rapidly. As parents, we must remember this, offering new chores to challenge our kids and give them more responsibility. Today, I marked my calendar with a large star every other month. That star is there to remind me to consider whether or not my children should be doing more - or more complicated - chores. Not only is this best for them (kids love hearing, "You're getting so big! I think you're big enough to..."), but it's good for me, too! Letting the children be responsible for a few additional chores really lightens my burden - which makes the whole family happier. This is the age when most kids should finish learning how to take care of a home. 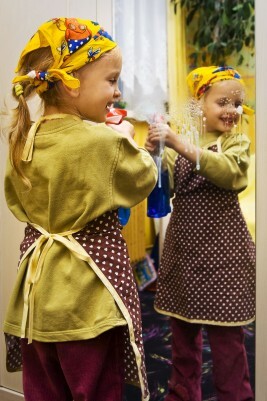 By the time they are 18, your child should have the skills to start running his or her own household. * Here's why: It gives them a sense of accomplishment and belonging, helps with self esteem, lets them learn life skills, teaches them responsibility, and helps them learn a biblical sense of servanthood. I also feel this is important. My oldest girls, 8 and 7, have made their own bed each day for at least a couple years now. They also have chores and a "helper," meaning one of their younger siblings. This, in turn, trains the little one how to do the jobs, too, and working together is more fun than alone for kids. The kids are thrilled when it is their turn to be the "kitchen helper," which is helping Mom make a meal. Gives us some special alone time. I'm sure to some you can sound like a real slave driver, but my kids have always been expected to pitch in and don't know any different. They are HAPPY to be needed, and it's training them up for a home and family of their own one day, too! The American Academy of Pediatrics recommends also lawn mowing after age 11. Our son has actually enjoyed that task!